W D Palisade Fence - Buy W D Palisade Fence Product on Anping County Shengxin Metal Products Co.,Ltd. Palisade fence is the most popular choice for locations requiring a higher level of security and vandal resistance, and can be seen protecting premises of many different types throughout the UK, the USA , Australia and so on. 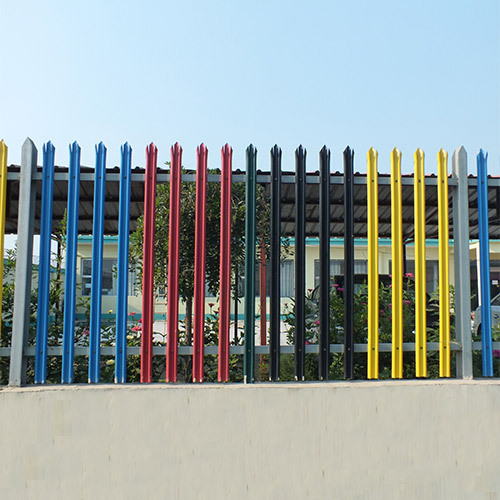 Galvanized steel palisade fencing is especially popular for schools and industrial sites because of its high damage resistance and the fact that it is so difficult to climb. Fencing is supplied to ISO in a standard range of 1.8,2.0,2.1,2.4,3.0 and 3.6 meter height. In according nonstandard fence configuration can be manufacturer for specific requirements. correct head to suit the requirement needed for your project. M8 BOLT: M8 bolt with tamper proof snap off cone nut, suitable for use with general purpose(GP) and security palisade fences(SP). M8 RIVETS: 8mm rivets with collars.